I ordered two Aeotec Key Fob's. To start they feel a bit plastic to me but okay, for the price it's fine. Then I tried to add them to my VERA3 UI5 network... The manual is typical a ZWAVE manual... If you haven't studied rocket science you will never manage to do anything with this device. It makes me hopeless every time I add a new device. - Add the Key Fob to my UI5 network in a way it can be used? Looks like there might be a hole on the back? Thank you very much for the link to this post. I am French but I don't seen the link http://www.maison-et-domotique.com/product-review/test-telecommandes-porte-cles-aeon-labs/comment-page-1/#comment-15172. PS : Since I deployed the Z-Wave technology in my home (3 months) I tried HOMESEER. This is a very powerful software but...too much complicated for my usage. One week ago I bought a Vera-Lite...what a pleasure!!!!!!! Seeting is very easy even if programming with Luup code is not very user friendly. But globally a very nice box! Thank you to all to sharing your experience. If anyone gets it to work I would be happy to hear it. Can I assume that you tried yourself though? Did you get past the issue to get the key fob into Use Mode? 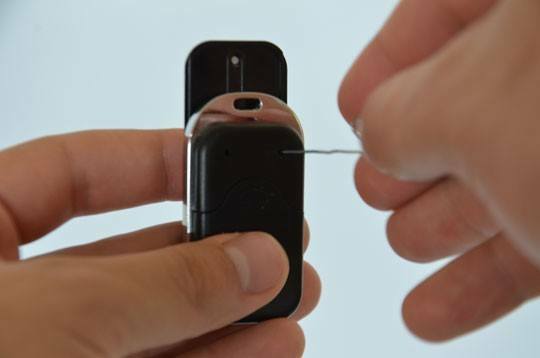 I don't have this device, but from the manual it appears similar in operation to the Z-Wave.Me key fob that was recently discussed here; that is, it sends out scene activation IDs 1, 2, 3, 4, etc. The screenshots of that device, as well as a look at Vera's configuration file, seem to suggest there may be no special handling for that key fob. - Include the key fob, per the manual; then switch to Use Mode. - Create a scene in Vera to turn a light on, with trigger 'A scene is activated', 'Which scene = 1'. Have you read the comment of Olivier ? (http://www.maison-et-domotique.com/product-review/test-telecommandes-porte-cles-aeon-labs/comment-page-1/#comment-15172) He contacted Micasaverde and I think the solution is really near what oTi@ suggests. I've ordered 2 of this devices. Can you tell us if you succeded to configure the device ? I did not read the comments so I missed this one. I've tried it and it works! Thank you all very much!!! Let's wrap it up (for later use so not all of you have to translate the French comments). On the back of the Key Fob are 2 holes. The right hole is the mode button that's mentioned in the manual. If you push it (with a needle or something like that) the led is green for 2 seconds to let you know you've switched from setup mode to use mode or back (you can't tell from the outside which mode it is in). Push it some more longer and the Key Fob will reset itself (led flashes red-green). Klik on button 3 of the Key Fob. If the Key Fob is in the setup mode the green led will light up and once it's connected to your network it will flash some times. If you go to devices tab you'll find a new device. Just give it a name (and room) and leave all other options as is (see attachment 2). The manual also talks about 'Press and hold 2 seconds' events for each button. Have you tried 'A scene is de-acticated'/'Which scene = 1', or 'A scene is activated'/'Which scene = 5' etc., to see if you can get the additional events? I didn't get that to work yet. Created a scene for a so called button 7 (I presume that should be button 3 pressed for 2 seconds) but nothing happened. I don't have much time to play with it today but maybe I'll try again on a later moment. I've just received my 2 Key Fob and tried your solution 'A scene is de-acticated'/'Which scene = 1' for the 'Press and hold 2 seconds' events and it works ! Thanks.